Okay, I should probably explain that, because I know a lot of people have no idea what the heck I’m talking about. Reddit is a website where people post pictures, links, and comments about things they find interesting, funny, disgusting, whatever. There are thousands of “sub-reddits”, which are devoted to specific subjects. In my case, I was on the “Once Upon a Time” sub-reddit, where fans of the ABC network’s “Once Upon a Time” tv show post theories, fan videos, etc. Right! Anyway, this leads into today’s topic, which is be careful how you advertise your book. 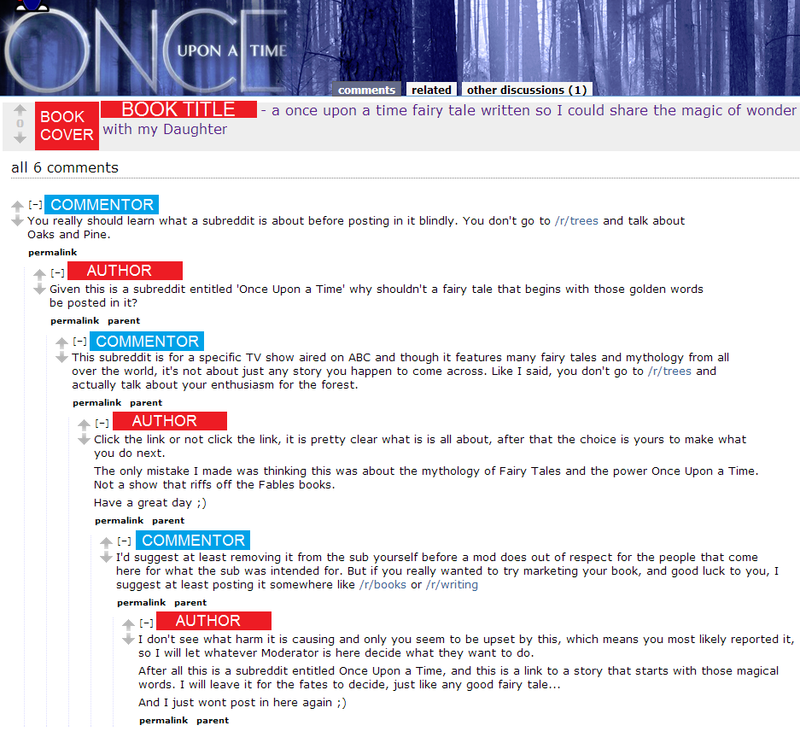 Here’s what happened: a self-published author went onto this sub-reddit, thinking it was about fairy tales in general (i.e., she didn’t do her research), and posted a link to her book. This is obviously a silly thing to do, as the sub-reddit is for fans of a television show, and is definitely not a place to post what is essentially an ad for your book. Most of the sub-reddit commenters ignored the post entirely. One did not, and took the time to explain to the author what she had done wrong. What followed was a very interesting conversation, which I think the author handled very poorly. She comes off as kind of haughty at the start, then gets snippy, and also kind of passive-aggressively implies the person she’s talking to is over-sensitive and a bit of an idiot. 1. Don’t advertise on a website if you don’t know the purpose of the website. 2. If you put your advertisement somewhere it doesn’t belong, just take it down. Don’t get into an argument with the person who points out what you did wrong! …and this is how self-published authors get a bad name. I swear, some people treat marketing like they’re trying to pick up one-night flings in a bar. Or in this case, trying to pick up a hook-up in the grocery store, where people are decidedly NOT there looking for that. At all. Love the UM today. I also am glad they started filling the bottles. There’s an analogy in there for book marketing, actually. Many people try a hundred different marketing methods and complain that they don’t see results, but the problem isn’t the package– it’s that there aren’t any contents that people want. 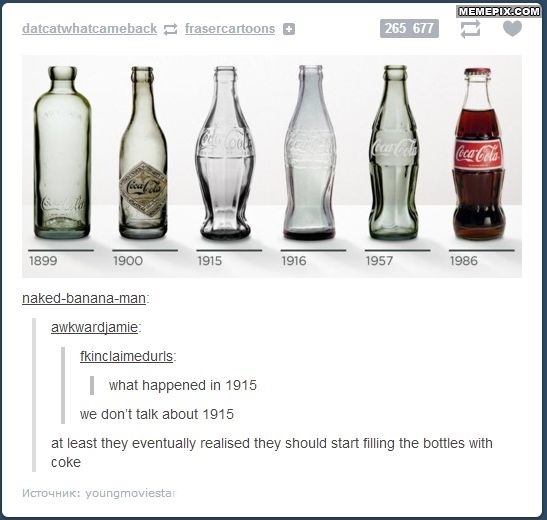 But instead of filling the bottle or coming up with another product, they just keep changing the bottle shape. No one I know personally, but you see it around. Actually, that’s a really excellent analogy — well done 🙂 I mean, the packaging is definitely important, no one’s denying that, but if the book is terrible, then no amount of packaging is going to hide the fact that it’s just a genuinely bad story. And also a great analogy with the grocery store! Clearly you’ve taken your vitamin A today (the A stands for analogy, obviously :D). Wow, yeah, she handled that *very* badly. Unfortunately, sometimes ‘bad press’ actually equals more sales. I doubt it in this case, but it has happened. Wow. My first thought was the author was just naive. Once the argument ensued, I changed my opinion to rather dense. Exactly. I actually felt pretty bad for her at the start, because let’s be honest, sometimes we don’t entirely do our research when we really should. But her subsequent comments … ack. I’m surprised that the author even stuck around for that exchange. Typically people only do a “drive by” post, when they’re peddling their stuff. The subreddit trees example of the commentor wasn’t really helpful (without Michelle’s explanation), so I can empathize with the author continuing the discussion. However, I do agree that when it became clear that the original post was off topic, it would have been time to stop. Yeah, the commentor was also definitely a bit on the snarky side — but I guess they figured that if this author is marketing on Reddit, they should have a basic working knowledge of the website. Also, I figure out what /r/trees was by just … you know … Googling it, which the author could have easily done! Yikes. I agree with all of the above, but I wonder if the author was being purposely confrontational. She hints that she knows about the TV series by calling it a knockoff of Fables (comic series similar and older than the show). I’ve actually talked with some authors who try to start flame wars or mess with people to build attention. Even if she didn’t know, it sounds like she’s still trying to hang the post out there to catch a few people no matter what. I guess what I’m saying is ‘Some authors be crazy’. Good point. Though, good flame wars get attention even if they’re on a small board. Either way, it’s really a bad idea to get into fights like that. Sometimes it’s a bad idea for an indie author to respond to people on a message board in the first place. Would have been smarter to apologize and take it down. That might have even gotten her a reader since it would have shown maturity. Ahahaha, what a great conversation! This is how I end up wasting hours on the Internet seeing conversations like this, lol. Can’t really say anything more than what you already said, maybe extend it to just be careful when you post on the Internet in general that you’re on topic. Yup, that’s pretty much the best thing to take away from this — this is the internet, your words are permanent once they’re posted, so make sure you don’t write something you’re going to regret a few weeks/months/years down the road! One thing Reddit groups, and other groups on other sites commonly dislike is self-promotion. It’s always good practice to ask the group’s moderator if it’s alright to post a link to something you’re promoting, whether it’s a book or a giveaway or whatever. Chances are the moderator will decline, or the moderator will point you to a link within the group – a subfolder, for example – where commenters are allowed to self-promote. Blindly self-promoting is just tacky, and it makes readers less likely to read your stuff. Exactly. I guess the author was thinking along the lines of “I don’t give a damn about this community, I’m just going to slap down a link and see if I get any bites. No harm in trying.” Except there IS harm in trying — she’s damaging the reputation of other self-published authors, and that’s not cool! Seriously! I tried to write a comment letting her know that she was out of line, but for some reason I’m just incapable of logging into Reddit, lol. It is a shame, because there are discussion groups that would be good places for writers to connect with like minded readers, but as is so often the case a few obnoxious users have ruined things for everyone–it’s usually just easiest to say “no ads” and keep it at that. Yeah, I believe the thread I talk about in the post has already been taken down by the mods. But isn’t that always the way — one rude apple ruining it for the rest of the … uh … pleasant apples? I believe examples like this show us why is it so hard at most of the times to establish a relationship between an author and the readership. And you can’t say that she is only damaging herself with this move, because in self-publishing, very often 1 move of one person tends to affect the whole industry,seeing there is so many just waiting to jump on a mistake’s throat. Thank you for sharing this, i think it is a nice example of what authors most definitely should not do. It’s especially tough for self-published authors because we don’t really have any sort of group or mass marketing machine that works to support our image and increase public exposure. At least this author confined her marketing faux pas to a smaller forum — imagine the damage she could have done if she’d posted it somewhere with thousands of viewers!